CweTrip EK-034-1 - Package includes: -1 x dc cable -1 x user manual -1 x led desk lamp Multiple brightness & lighting mode: provides 3 levels of brightness and 5 different light temperatures; offers lots of lighting options for your different lighting needs. Built-in 5v/1a usb charging port conveniently charge your device without damage. Flexible design: 180 degree vertical adjustable lamp head with 90 degree vertical adjustable arm give the perfect angle every time. Eye care: the led panel provides a glare free, and natural lighting for reading, working, and studying, non-flickering, creating warm and soft atmosphere. Modern and elegant: Aluminum and matte finished arm & head, extremely contemporary design. Specifications: input voltage: dc5v 1-2a desk lamp wattage: 6W Material: Aluminum lamp head and arm +Plastic lamp base Product weight: 1. 43lb 5 dimming levels the lamp offers 5 levels of brightness, which is great because you can dim the light to find the perfect brightness level for your situation. 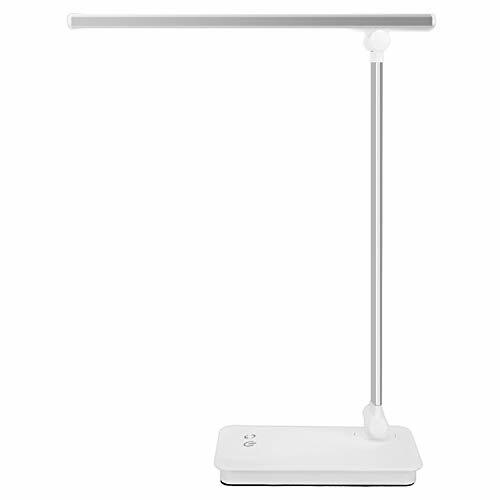 Energy-saving the led desk lamp uses power-saving LEDs, which consume 85% less power than traditional incandescent lights at the same level of brightness. Touch-sensitive control all operations including power on / off and brightness up / down, are all done by sliding your fingers on the touch-sensitive panel. CweTrip Dimmable LED Desk Lamp with Built-in 1800mAh Rechargeable Battery, 3 Lighting Modes, 5-Level Dimmer, Touch Control, Memory Function, 6W, 5V/1A USB Charging Port, Silver - High thermal conductivity the lamp arm & head is made of high-quality aluminum material, which effectively conducts out the heat from the leds and prolong its lifespan. Soft on your eyes the led desk lamp emits flicker-free, even and non-glare light, helping you avoid eye fatigue caused by flickering light and harsh glare. DILISENS Smart Plug Wi-Fi Mini Outlets Sockets - Perfect for hard-to-reach appliances & devices without ON/OFF switches. Energy monitoring & timer function】- track power usage for connected devices and figure out which devices use the most energy. Sync lights and devices to sunrise, one-click to schedule your outlets at home, 5 steps to set up with Alexa, sunset, only support 2. 4ghz wi-fi when configuring, or pre-set times automatically. With the convenient timer function, prevent from overcharging and overheating, the smart plug can protect the devices safety, and reduce energy use. Customer first & warranty】- 30-day money back, if the outlet is on, these smart outlets can automatically come back on, 12-month warranty and lifetime support. Alexa Echo Plug, DILISENS 2 in 1 Smart Plug Mini Outlet with Energy Monitoring,15A Wi-Fi Mini Smart Socket Switch Voice and App Controlled, Compatible with Amazon Alexa Echo/Google Home/IFTTT 2 Pack - Easy to set up - works with “ smart life” app step 1: download the “ smart life ” app; step 2: Plug the Smart Wi-Fi Plug into any outlet; Step 3: Configure Smart Wi-Fi Plug preferences on the “ Smart life ” App. Dilisens 2 in 1 mini smart socket - manage your home, google play, whether directly with your smartlife app on your smartphone, or with alexa /google home voice control set up at home ✔works with alexa / google assistant / IFTTT ✔2 IN 1 Compact Design ✔Achieve Individual/Group Control ✔Max 15A ✔Schedule Feature ✔Timer Function ✔Energy Saving ✔Energy Monitoring App Download Search " Smart Life " on App store, even from afar DILISENS WiFi 2 IN 1 Electrical Outlet empowers you to remotely control your appliances, or Scan the QR code on the User Manual and install it. You can effectively cut your usage so that you can save money on your next electric bill. Set up with amazon alexa step 4: set your echo speaker by alexa app step 5: enable our skill in Alexa APP Note: Please keep in mind that the “ Smart Life” App should be set up first before setting up the Alexa device, please also refer to user manual for more detailed steps. Technical specifications model: sp201 2 in 1 and space-saving design real time energy monitoring Overcurrent protection ETL, FCC, RoHS Certified Input Voltage: AC 110V - 240V Output: 15A Maximum Load Wireless Type: 2. Jif - With the convenient timer function, prevent from overcharging and overheating, the smart plug can protect the devices safety, and reduce energy use. Customer first & warranty】- 30-day money back, these smart outlets can automatically come back on, if the outlet is on, 12-month warranty and lifetime support. You can effectively cut your usage so that you can save money on your next electric bill. Notes: after a power outage, and there is no need to reset them, when power returns, make you feel at ease and give you a truly smart life. Ships in amazon Certified Frustration-Free Packaging. Jif creamy peanut butter, 16 ounce pack of 3 Hands-free voice control】- solid integration with amazon alexa, google home and ifttt. Jif Creamy Peanut Butter, 16 Ounce Pack of 3 - . Sync lights and devices to sunrise, one-click to schedule your outlets at home, sunset, 5 steps to set up with Alexa, only support 2.4ghz wi-fi when configuring, or pre-set times automatically. Gluten free. Easily manage home: 1 minute to set up with your Wi-Fi, Max 15A. 2 in 1 & space-saving design】- dilisens mini 2 in 1 smart plug, both outlets can be controlled individually or in groups, only occupies a single outlet on your wall panel, greatly improve the practicability, more convenient and energy saving; Compact and Super Mini, one socket equals two, without getting in the way of other plugs，you can carry it along during your travel; You can also create a group for all your smart devices and control them with one command. All within fingertip】- instead of reaching for outlets and plugs every time, Countdown, energy efficient, Set timer, you can easily create your own schedule, Away mode, create scenes, share the device with your families at your fingertip; Enjoy peace of mind by checking on your devices remotely and always coming home to a well-lit house. FrSky SG_B01N5INCBH_US - Sync lights and devices to sunrise, one-click to schedule your outlets at home, 5 steps to set up with Alexa, sunset, only support 2.4ghz wi-fi when configuring, or pre-set times automatically. Perfect for hard-to-reach appliances & devices without ON/OFF switches. Energy monitoring & timer function】- track power usage for connected devices and figure out which devices use the most energy. Ultra mini Only 1. 6g!!! specification: Dimension:21. 5x12x3. 5mmlxwxh Weight: 1. 6g number of channels:up to 16ch from sbusch1~ch15 for pWM, CH16 RSSI for FC Operating Voltage Range:3. 7~10v operating current:[email protected] operating Range:FULL range With RSSI output on board:Analog 0~3. 3v firmware upgradeable compatibility:FrSky D16 mode Hands-free voice control】- solid integration with amazon alexa, google home and ifttt. FrSky XM Plus Mini Receiver up to 16CH ONLY 1.6g Full Range Fit For Micro Drone - Notes: after a power outage, when power returns, and there is no need to reset them, make you feel at ease and give you a truly smart life. Ships in amazon Certified Frustration-Free Packaging. Full range, so identical to your X4R and D4R setups. Xm plus receiver supports failsage function for all channels.